There are many members of QAECO who work on projects incorporating adaptive management. This post describes an example of one such project lead by Cindy and José along with Yung En Chee, Brendan Wintle, Chris Jones, Peter Vesk & David Duncan. Kangaroos are overgrazing native vegetation in Wyperfeld National Park. To assist Parks Victoria in adaptively manageing kangaroo impacts on vegetation, with a focus on canopy plant species recruitment. The study area is within Wyperfeld National Park (WNP) in north-west Victoria. WNP is the third largest park in Victoria (over 3500 km2) and makes up part of the Victorian mallee. 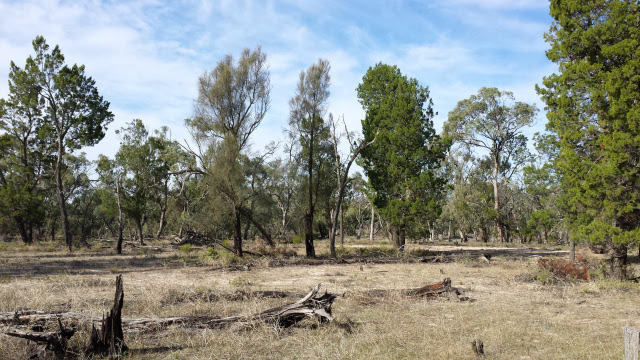 The study area is an area of Pine-Buloke (Callitris gracilis and Allocasuarina luehmannii) vegetation, which occurs in parts of the park subject to infrequent flooding. This area has been impacted by grazing for over a century. Livestock grazing was banned in the park in the 1990s and since then kangaroo numbers have increased markedly. The population was able to remain large through dry periods because the permanent water points remained from previous agricultural practice. The large kangaroo population has overgrazed the understorey vegetation, and has negatively affected shrub and tree recruitment. In 1998 a culling program begun to reduce kangaroo numbers and prevent overgrazing. 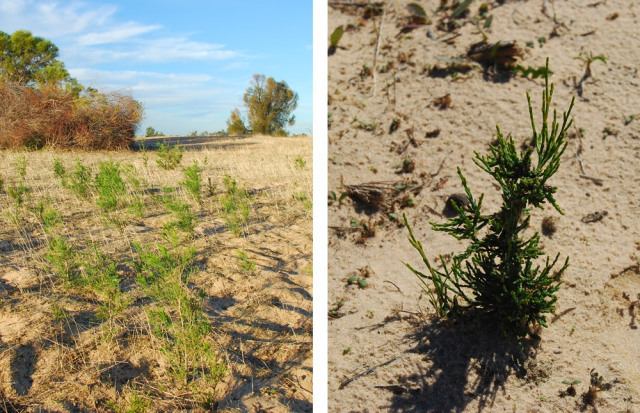 The aim was to allow some of the tree and shrub seedlings to ‘escape’ kangaroo grazing and grow into reproductive adults, as well as reduce pressure on understorey flora. However, evaluating the management program has been difficult in the absence of vegetation monitoring and a clear conceptual model linking kangaroos and vegetation. On a recent visit, we found that there are currently very few seedlings within the park. To get an adult tree growing in the park where there wasn’t one before, a number of things need to happen. First, there needs to already be an existing reproductive individual (or two) to produce the seed. That seed needs to be viable (healthy) and then it needs to germinate. Finally the germinated seedling needs to survive until it becomes mature enough to no longer be at risk of grazing and able to reproduce itself. We’ve outlined this process in a simple conceptual diagram (Figure 2). What are ‘sufficient environmental conditions’? If kangaroo grazing is the bottleneck, how do we find out how many kangaroos need to be culled to allow regeneration? Are there other factors acting in this system that we don’t know about? Figure 3 Left: What was needed for Callitris recruitment? Right: a closer look. Callitris seedling resprouting after being grazed. How much can it take? José has written a great summary of the pilot study for this project. 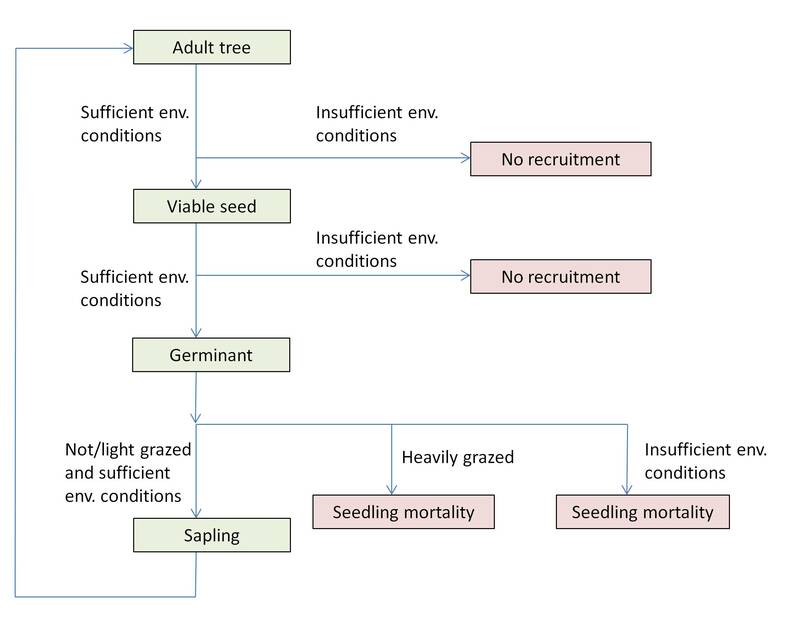 In it he discusses our current understanding of grazing effects on tree seedling recruitment and how it could be managed. At this stage, the study is still in its infancy and the immediate tasks are to clearly define the management objectives (sustainable pine-buloke woodlands through healthy recruitment), management options (primarily kangaroo culling, possibly planned burns, active revegetation, and/or active seedling protection) and develop an explicit process model. Once this is all done we can work out which uncertainties (i.e., the questions above) will effect the management decisions to be made and we can set an adaptive management plan in motion. This entry was posted in ARC-CEED, Qaecologists and tagged Adaptive management, Biodiversity, conservation, ecology, Environment, habitat, management, research, science, species. Bookmark the permalink.